We are thrilled to be in Las Vegas for AWS re:Invent 2018 and our annual Global Partner Summit. This year’s conference provides AWS Partner Network (APN) Partners with opportunities to connect, collaborate, and discover. APN Partners from across the globe are here and busy attending breakout sessions, chalk talks, and hands-on training to learn how AWS and the APN program can help build and grow your business. 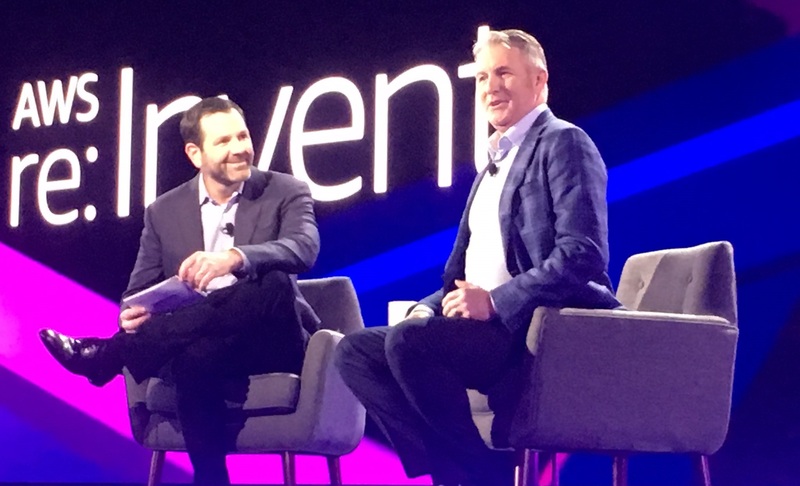 Amazon Web Services Chief Technology Officer Dr. Werner Vogels delivered his annual re:Invent keynote, diving deep on new AWS services at the state of cloud computing in 2019. Dr. Werner Vogels Keynote: Werner announced new AWS services such as the Well-Architected Tool, Amazon Managed Services for Kafka, and a slew of new AWS Lambda features. Sponsor Booths at the Expo: The Expo at The Venetian hosted the AWS Village, Developer Lounge, Builders Fair, sponsor booths, and content theaters. Special thanks to all of our APN Partners who participated in the Expo and spent time connecting with AWS customers.AWS Competency Partner Datadog was named the “Sponsor of the Year” at re:Invent. 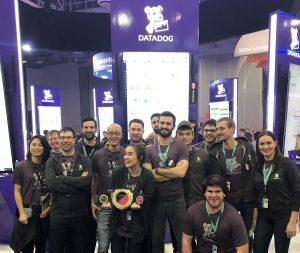 Congratulations, Datadog! re:Play Party: Not just an EDM concert and interactive extravaganza, the popular re:Play party is the ultimate playground for those of us who didn’t get the memo that grown-ups don’t play. If your organization needs additional certifications to qualify for the next APN Partner Tier, or your staff wants to take that next step on their AWS Cloud journey, Friday is the last day to take onsite AWS Certification exams at re:Invent. Earning an AWS Certification helps you demonstrate your deep technical skills and expertise to design, deploy, and operate applications and infrastructure on AWS. Join us December 4 at AWS Innovate, re:Invent Recap Edition. This is a free online conference providing a complete wrap-up of AWS re:Invent 2018 keynotes, sessions, and launches. With content tailored specifically for APN Partners, you’ll hear the very latest from the Global Partner Summit, including information on how to leverage AWS technologies to serve your customers, and how the APN Program can help you build and grow your business on AWS. 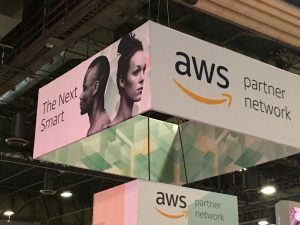 Amazon Web Services CEO Andy Jassy delivered the AWS re:Invent keynote and introduced new AWS services such as Amazon FSx, AWS DeepRacer, and AWS Managed Blockchain. Andy Jassy Keynote: Andy’s keynote was full of AWS business updates, service launches, and announcements. You can watch the full keynote blow, or read the AWS News Blog for the full details on today’s big updates. AWS Competency and MSP Partners can visit the APN Booth #2547 in the Sands Expo during operating business hours. We have a professional photographer onsite to take a side profile headshot to match “The Next Smart” ad campaign look-and-feel. We’ll collect your email address and ensure you get your own high-resolution copy of the photo. A few weeks after re:Invent, we’ll send you the photo along with further instructions on how to build a personalized marketing asset via APN Marketing Central to help your organization build demand for their vetted, validated, and verified solutions on AWS. APN Partner Sponsor Booths: There are a lot of APN Partners attending re:Invent, and this is always a great chance to reconnect with contacts and make new connections. Be sure to visit the sponsor booths at the Sands and Aria Expos to network and learn about APN Partners’ business solutions. Amazon Chief Technology Officer Dr. Werner Vogels will deliver his annual keynote on Thursday, exploring new AWS services and the state of cloud computing in 2019. Not just an EDM concert and interactive extravaganza, the re:Play party is the ultimate playground for those of us who didn’t get the memo that grown-ups don’t play. The APN hosted our annual Global Partner Summit keynote today at The Venetian. The keynote was emceed by Terry Wise, Vice President, Global Alliances and Channels, AWS. Terry welcomed several AWS customers and APN Partners on stage to discuss their cloud journey. Special thanks to Pebbles Sy-Manalang, CIO at Globe Telecom; Bernd Heinemann, Board Member at Allianz; Ramin Sayar, President & CEO at Sumo Logic; and (pictured above) Brad Jackson, CEO at Slalom Consulting. APN Program Changes: One of the key announcements we made during the GPS keynote was a set of updates to the overall APN program that will recognize and support the growth, investment, and innovation of our evolving APN Partner community, and better align APN Partners to more structured program benefits. Amazon Web Services CEO Andy Jassy’s keynote highlights Wednesday’s slate of events. Be sure to arrive at The Venetian early to get a good seat, and hear about the major AWS services launches for 2019. Don’t forget that you can sign up for re:Invent keynote livestreams here. The AWS Navigate Program provides a prescriptive path for APN Partners to build a specialized practice on AWS. Our Navigate tracks offer APN Partners the guidance they need to become AWS experts and deploy innovative solutions on behalf of AWS customers. Based on high demand from our APN Partners, we developed the AWS Navigate Program to help APN Partners become successful in their business differentiation journey on AWS. You can take these tracks today and start building a specialized practice in each area. AWS re:Invent is all sold out, and it was an action-packed first day with AWS Certification exams, hands-on labs, bootcamps, breakout sessions, and more. 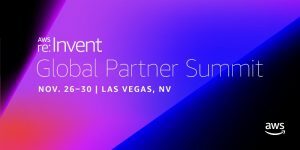 This year, Global Partner Summit sessions are taking place throughout the week across the entire re:Invent campus. Tuesday morning’s GPS keynote will be held at The Venetian, while breakout sessions are at Aria, Bellagio, MGM Grand, Mirage, and The Venetian. Check out the full agenda of GPS sessions if you’re still trying to build your schedule. Some GPS sessions have capacity, but be sure to arrive early! APN Partner Booth: The APN Booth opened today and is a great place for APN Partners to meet with AWS experts (including our new APN Ambassadors) and APN staff. We are excited to discuss how you can differentiate your business offerings through the APN program, integrate solutions with AWS, leverage APN co-marketing opportunities, and more. The APN Booth is located at the Sands Expo (booth #2547). We’ll be here all week, so stop by after Tuesday’s Global Partner Summit to learn more about all the new announcements. Partner Marketing Meetings: APN Partners are meeting with the AWS Partner Marketing Team to discuss the co-marketing programs that we offer. This includes Partner Demand Generation, APN Marketing Central, Integrated Partner Campaigns (IPCs), and Digital Marketing Services. The AWS Sponsorship team is also on hand to help APN Partners learn how to participate in AWS-led events and get in-person access to AWS customers and prospects. The Partner Marketing Briefing Center is located at The Venetian, Hall D, Meeting Room #200. You can request a meeting here. APN Partner Bootcamps: Led by AWS Solutions Architects, bootcamps are an opportunity to hone existing skills and learn new ways of working with AWS. We hosted several exclusive bootcamps today for APN Partners, diving deep on AWS technical foundations, machine learning, and migration. Each bootcamp helped APN Partners gain a greater understanding of how AWS solutions address customer business requirements. Need more training after re:Invent? We have a full set of APN Partner Training offerings for you to select from! The annual Global Partner Summit keynote is Tuesday at 8:30 a.m. in The Venetian, Level 2, Hall A. The keynote will be emceed by Terry Wise, Vice President of Global Alliances and Channels, AWS. Arrive early to get a good seat, and get ready to learn about cloud-powered innovation and the business opportunities it creates for APN Partners. If you’re at re:Invent and working the Expo Hall on Tuesday morning but can’t make the GPS keynote, we’ve got you covered there, too. The keynote will be livestreamed to the Expo Hall until doors open to the public. If you’re not in Las Vegas, sign up for re:Invent keynote livestreams here. 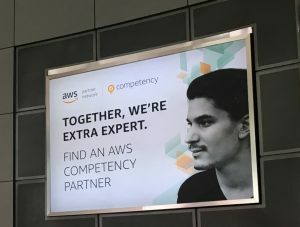 For AWS Competency and MSP Partners attending re:Invent, you may have seen our awareness campaign featured at McCarron International Airport in Las Vegas. The campaign is titled The Next Smart and advertisements were featured in both the Terminal 3 Baggage Claim and Terminal 1 Rotunda just outside the baggage claim shuttle. AWS Competency Partners can visit the APN Booth #2547 at the Sands Expo during operating business hours. We have a professional photographer on-site to take a side profile headshot to match “The Next Smart” ad campaign look-and-feel. We’ll collect your email address and ensure you get your own high-resolution copy of the photo. 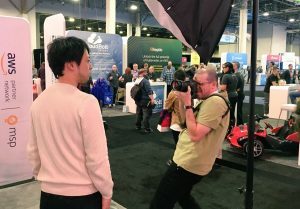 Please stop by the APN Booth to participate in “The Next Smart” photoshoot! Follow @AWS_Partners on Twitter for re:Invent info exclusively for APN Partners!